Neighbour bills parents for car damaged by toddler - and they say thanks! Neighbour bills parents for car damaged by toddler – and they say thanks! 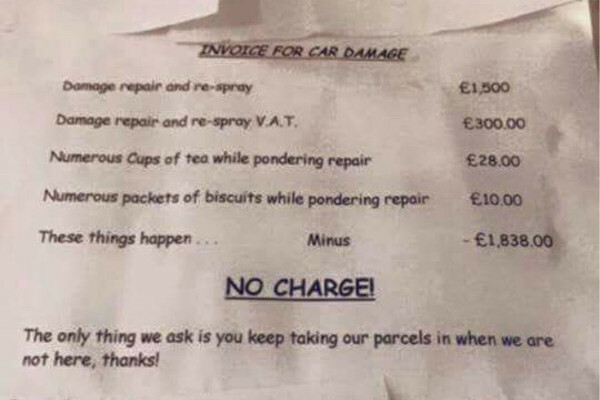 A family in the UK received a bill for ₤1838 after their toddler accidentally damaged a neighbour’s car. You’d think they would be upset, but this surprising invoice made them smile. We all know kids can be destructive, often without intending any harm. Recently in the UK a three-year-old boy opened the family’s car door and swung it straight into the neighbour’s car. Crunch! It was an accident that could happen to anyone. His parents admitted the damage to their neighbour and offered to pay for repairs. They knew this would save the hassle and cost of going through insurance, plus it was the neighbourly thing to do, right? The following week their neighbour handed them an invoice for ₤1838, including charges for cups of tea and biscuits consumed while musing over the damaged car. But the last line made them smile. ‘No charge!’ read the invoice, “these things happen”. All the neighbour asked was that the parents continue to collect their mail when they are away. Now that is some neighbourly love. The happy parents thought this sweet gesture deserved to be shared so they posted a photo of the invoice online to share this story. It certainly brightened our day. If only the parents who charged a five-year-old a ‘no show’ fee for missing a birthday party had been so kind.